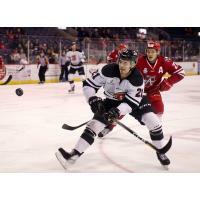 Allen, Texas - The Allen Americans, ECHL affiliate of the Minnesota Wild, dropped a 6-3 decision to the Rapid City Rush on Wednesday night in Allen. The Americans went 2-2-0 on the homestand. Former Americans forward Tyler Poulson, had a goal and three assists and finished the game a plus-three leading the way in the Rapid City win. Garrett Klotz scored for the second game in a row against his former team, and now has five goals on the season. Americans rookie netminder Kyle Hayton was pulled in the opening period after giving up four goals on eight shots. Jeremy Brodeur replaced Hayton and stopped 15 of the 16 shots he faced. The Americans are 18 points behind the first place Tulsa Oilers and Utah Grizzlies. Wichita is six points ahead of Allen for last place in the division. The Americans open a six-game road trip on Friday night in Kansas City. They don't return home until December 19th against Cincinnati.